Bus from Kuala Lumpur to Manjung is the most convenient and reliable mode of transport for locals especially working adults and students to travel from Kuala Lumpur to Manjung. Also, Manjung is a district famous for being a gateway to Pangkor Island, one of the major attraction in Perak, Malaysia. Maju Express, Kesatuan Express, Transnasional, Plusliner and Sepakat Liner Express are few operators operating bus service from Kuala Lumpur to Manjung. Transnasional is the main players between them by providing the highest number of daily departures from Kuala Lumpur to Manjung. Their combined trips from Kuala Lumpur to Manjung have total up to 16 daily trips. The first bus provided by Maju Express starts at 2:00am and the last bus service provided by Transnasional is at night 10:30pm. In between, there are numbers of bus services from Kuala Lumpur to Manjung available. The duration required for bus from Kuala Lumpur to Manjung is approximately 4 to 4.5 hours depending on the road traffic condition on the departure day. As there is no toilet facility on board, washroom break will be given upon request from the driver during the journey. The bus ticket price from Kuala Lumpur to Manjung is costing in a range of RM 26.90 to RM 27.00 depending on your selection of bus operator. The boarding points in Kuala Lumpur is either at Terminal Bersepadu Selatan or Hentian Duta Bus Terminal depending on your selection of pick up point during the booking. Upon arriving Manjung, the bus service will terminate at Manjung Bus Terminal. 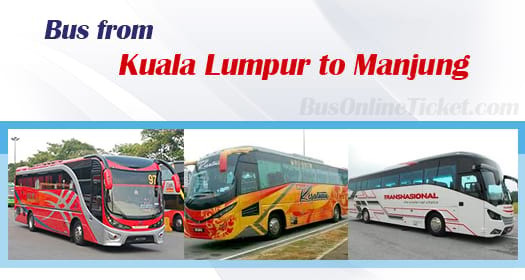 Book your bus ticket online at the most convenient and trusted online ticketing portal BusOnlineTicket.com and travel from Kuala Lumpur to Manjung. Online payment can be done with many ways in BusOnlineTicket.com such as credit card, internet banking, Paypal, Alipay and many more. Instant confirmation of booking will be received upon payment is done.